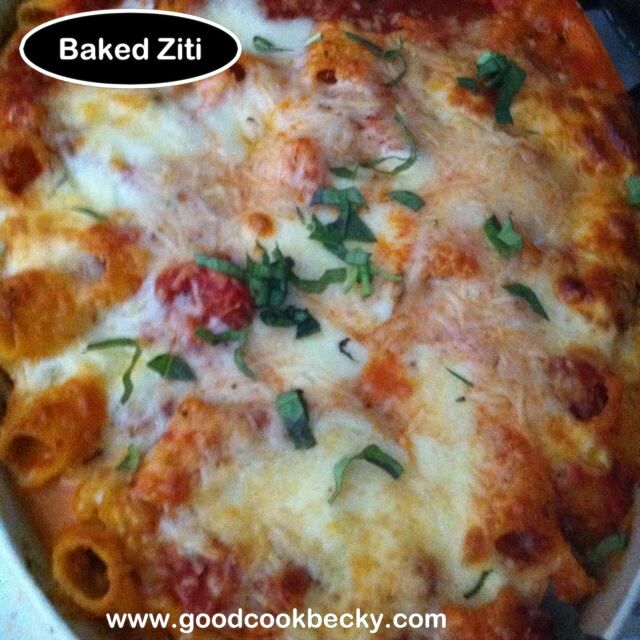 I think the last time we had Ziti, my husband cooked it! At that time, I was in bed recovering from a very painful spill down the stairs of my house – I do not care to repeat that – the falling down stairs on my back part – not the hubby cooking part – he did a fine job- he just prefers to program computers – and THAT is something I can’t do! I love to cook! It has been 2 years since my fall and I am doing much better now, though I still have not learned to walk – that is.. I fell again this summer, but did not injure myself nearly as badly this time! I am a klutz! I adapted the recipe a little, because it was meatless, and my husband loves meat in his Ziti. The other change I made was I used Ricotta cheese instead of cottage cheese (it is a texture thing for me). The recipe was easy to follow , though it had a lot of steps, but the results were very good. Preheat the oven to 350F and adjust the oven rack to about the center position. In a medium bowl, stir together the Ricotta cheese, eggs, and 1 cup of the Parmesan cheese and set aside. Bring a large pot of salted water to a boil, and cook the pasta according to package directions, until it is just underdone. Drain and set aside (in the colander). In a large skillet, heat the oil and cook the garlic for a minute or two until the garlic is fragrant but not browned. Stir it the tomato sauce and diced tomatoes. Add the oregano and simmer the sauce for 10 minutes over medium low. Turn off the heat and add 1/2 cup basil and sugar. Season with salt and pepper to taste. In another skillet cook the ground beef seasoned with 1 tsp of salt. Cook until done and drain off any fat. Set aside. With heat off, stir the cream and cornstarch in the stockpot you used to boil the pasta (so you don’t have to dirty any other dishes). Turn the heat on to medium and stir constantly for 3-4 minutes until the mixture is slightly thickened. Turn off the heat and remove the pot from the heat source. Add in the cheese mixture and 1 cup of the sauce, half of the mozzarella dices and drained ground beef. Add the pasta to coat it thoroughly. Pour the Ziti into a 13×9″ baking dish. Pour the remaining tomato sauce over the casserole. Top with remaining mozzarella cheese and Parmesan cheese. Spray a piece of tinfoil with cooking spray (to prevent the cheese from sticking to the foil during baking), and cover the casserole tightly. Bake for 30 minutes at 350 for 30 minutes and then remove the foil, return to oven to bake another 30 minutes until the cheese is golden brown and bubbly. Let sit for 10 minutes after baking. Sprinkle with remaining 2 Tbsp of chopped basil. 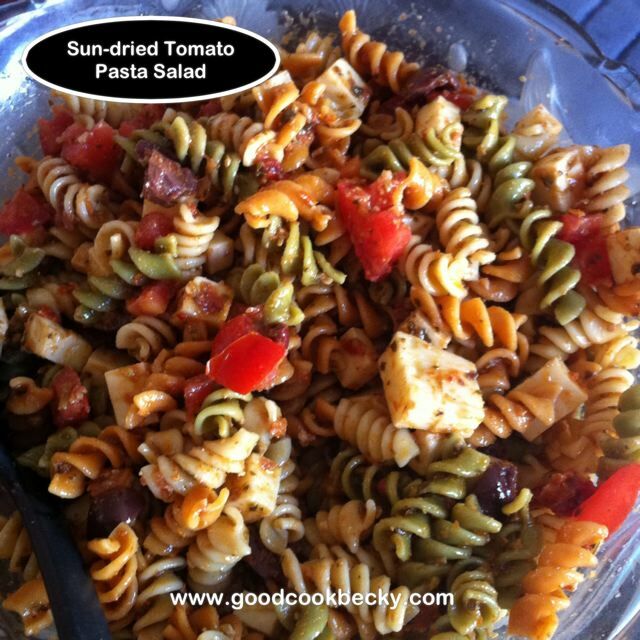 Serve with fresh French Bread or garlic bread and salad. Categories: American Test Kitchen Recipe, Ethnic, Ethnic - Italian, Main Dish, Main Dish - Pasta | Tags: baked ziti, Cook's Country Baked Ziti | Permalink. Combine the pineapple, red bell pepper, green onion, brown sugar, and dry pepper flakes. Stir to mix. Cover and refrigerate for 30 minutes or more. Serve with pork tenderloin. 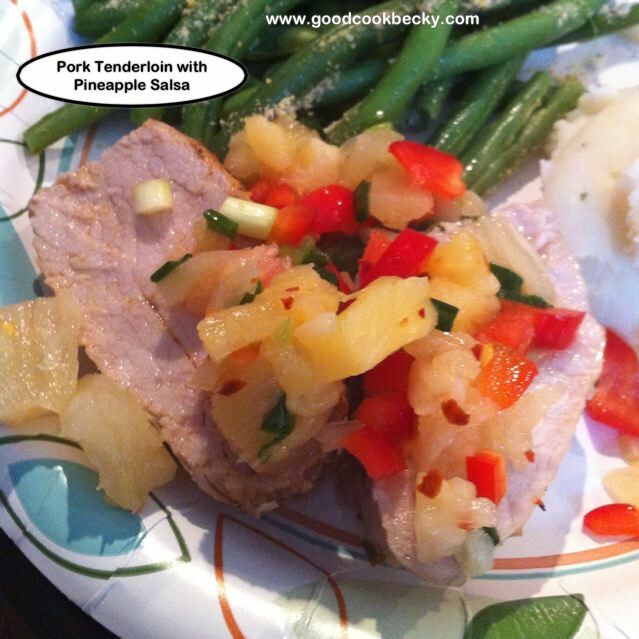 Categories: Fruit, Main Dish, Main Dish - Pork, Side Dishes | Tags: Fruit Salsa, Pineapple Salsa, Pork Tenderloin with Pineapple Salsa | Permalink. I remember having rhubarb from time to time as a child, but never made any in my near 20 years of marriage. My husband in fact, never had any rhubarb that he can remember! This, I had to correct! 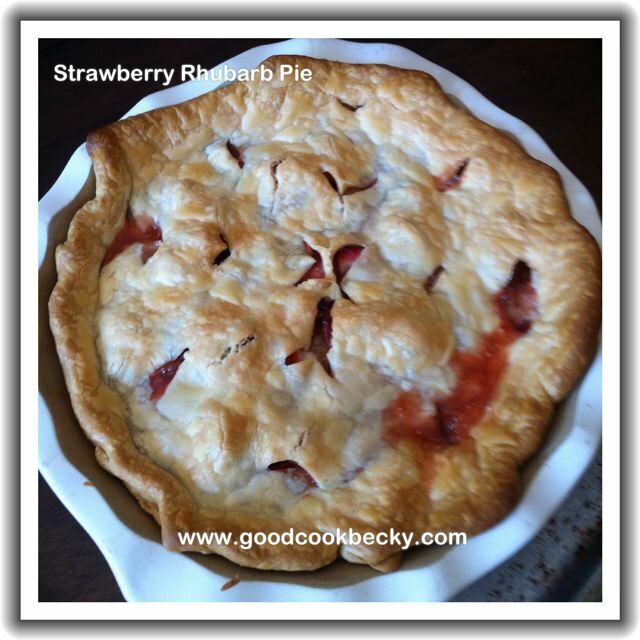 My Mom sent me a recipe for a strawberry rhubarb pie that was easy to make — and I found out also equally delicious! I used a pre-made pie crust from the grocer’s refrigerated section. This makes the process for pie making even easier! The original recipe called for 1 1/4 cups sugar. I reduced it to 1 cup, but next time will only use 3/4 of a cup of sugar. The only unusual ingredient is Minute Tapioca. This serves as a thickening agent. Prepare the pie pan with the first crust. Combine sugar, tapioca, salt, and cinnamon and mix with the chopped rhubarb and strawberries. Toss to combine. Fill the pie with the filling. Dot the tops with little pieces of butter. Cut the top crust with slits to vent. Top the pie and seal the edges. Bake pie at 400F for 40-45 minutes. Allow the pie to cool before slicing. (If you cannot wait, it is still good, but may be runny). Categories: Baking, Baking - Desserts, Fruit | Tags: Pie, Rhubarb Pie, Strawberry Rhubarb Pie | Permalink.